Cerrado woody species are divided into a small group of aluminum (Al)-accumulating species and the rest of the woody species. Both groups grow well on acidic and Al-rich soils. We found a Cerrado remnant growing on a calcareous soil with high calcium (Ca) and low Al saturations (m%). 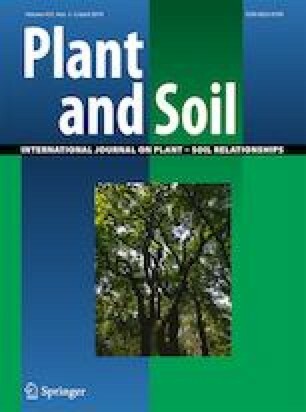 We checked whether Al deposition differs between leaf veins and leaf blade, and predicted that plants grown on the acidic soil store more Al than those grown on the calcareous soil. Adult plants of Qualea grandiflora and Q. parviflora, two Al-accumulators, were found in this area, and we compared leaf Ca and Al concentrations with those of the same species growing on a dystrophic Cerrado soil. Leaf Ca concentration reflected differences between the soil types, and Ca was more accumulated in leaf veins. However, Al accumulation was independent of m%, and it was more deposited in the leaf blade of both species, which was confirmed by hystochemical reactions and X-ray spectra in SEM analysis (EDS). The leaf tissue to which Al is preferentially allocated in the leaf blade could not be distinguished. Granules in epidermal cells exhibiting high Al EDS peaks suggest an important allocation for this metal. The online version of this article ( https://doi.org/10.1007/s11104-019-03978-2) contains supplementary material, which is available to authorized users. MA Nogueira acknowledges the Coordination for the Improvement of Higher Education Personnel (Capes) for a MSc. scholarship. ACG Bressan acknowledges the São Paulo Research Foundation (Fapesp Grant# 2014/14386-0) for a PhD scholarship, and G. Habermann acknowledges the Brazilian National Council for Scientific and Technological Development (CNPq) for a productivity fellowship (Grant# 309149/2017-7). ACGB, MAN and GH conceived and designed the experiments. ACGB, MAN and MHOP performed the experiments. ACGB, MAN and GH analyzed the data. ACGB, MAN, MHOP and GH wrote the manuscript.